You are cordially invited to attend a blitz presentation and discussion event for the new International Working Group affiliated with the Life Sciences and Society Program (LSSP), Bond Life Sciences Center. For the third year in a row, we are continuing with the Theme of FOCUS ON AFRICA. The purpose of LSSP International Working Group is to encourage MU scholars with international interest to meet each other, stimulate each other’s thinking, and potentially lead to the creation of broader research network and joint scholarship. Topics across the year are chosen to highlight the intersection among multiple disciplinary perspectives with a common geographical focus; this year’s focus will be on Africa. Focus on Africa was very informative! We had 44 participants in attendance. The speakers had different topics one was about how green nanotechnology efforts may discover a cure for prostrate cancer and the second speaker discussed Child soldiers in Africa and the impacts on the youth and their communities. There were lots of questions from the audience. The audience was engaged. We also took lots of photos and I will share some with you. The Focus on Africa program was sponsored by the Africa Hub, the Office of Research and CAFNR International Programs. Afterwards the audience stayed and asked questions to the presenters and the discussion continued. The Memorial Union Student Staff was very helpful. MUTV made a video and It is posted on the Africa Hub Facebook page so you can watch when it is convenient for you. Please join us for our next focus on Africa on Wednesday 11/7/18 12-1 pm Memorial Union S-110. We will have pizza bring your own drink. 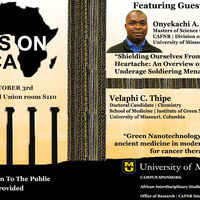 Focus on Africa will take place during the rest of the fall semester: Please join us.